Home > Ask Our Experts > Could I Get a Grant For New Embroidery Business? 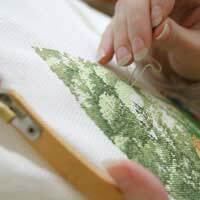 There are no specific UK grants for an embroidery business. This is not a cause for pessimism, however. Instead, you need to find a grant that matches one or more of the following factors: your circumstances; where you live; and what you need the money for. Your circumstances can dictate the type of grant you apply for. If you’ve been claiming Jobseeker’s Allowance for 18 months or more, for instance, you may qualify for the government’s New Deal programme. This can help you get your business off the ground. Gender is also relevant to grants. If you’re female, you may be able to take advantage of a scheme that encourages women in business. The Women’s Development Programme in Derry is one example. Check the government’s Grants and Support Directory (available online). You may find something to match your circumstances. The Derry example above links a grant not just to gender but also to location. This approach to grant funding is not unusual. Where you live is one of the key factors grant dispensing bodies take into account. Just a glance through the Grants and Support Directory makes this clear. A start-up grant for a business, for instance, almost always specifies a certain location for the new venture. An example is the South Tyneside Business Start-Up Grants scheme. If there’s a government sponsored business advice centre in your area, contact it and enquire about local grants. Clearly, you want money to start an embroidery business. You should note down, however, your specific needs. These might include premises; machinery; employees; training; or even help with a business plan. There are grants that can assist with these needs. To help you further, look at the government’s Grants and Support Directory. It has details of particular business grant requirements. Please note, however, that your location and circumstances may still affect the outcome of an application. This reflects the complex nature of the grant system in the UK. The answer is to conduct detailed research based on the criteria discussed here. Create a checklist that includes your circumstances, your town and region, and what you’d ideally like a grant to cover. Many people who persist, do eventually succeed. I have been working as an embroidery machine operatorsince 2012 and currently,i want to advance in owning my own embroidery business but i need financing to be able to start that business.